Until now, I never fully understood why American politicians have historically held such strong hatred and opposition toward Communism. Similar reasons for America’s disdain for Communism could also be presented for another country’s disdain toward Capitalism – America’s current system of government and way of life. After doing more research, I have concluded that, in theory, Communism is actually not a bad thing. Now, I am not saying that I am now a subscriber to Communism or Marxism, and surely not in the way that many in the West have come to perceive what it actually is – a perception which is highly flawed, and has been perpetrated to the masses as evil, bearing a mean and vile dictator who abuses his own citizens and forces them to accept and exist at a lower standard of living. I have further concluded that none of the popular social and/or political theories or ideologies are bad per say. “In theory” they all could work. I am convinced that the people who are administering said theories and ideologies, who are putting motion to it, are the ones who corrupts it. In other words, it is man himself who poisons these systems. I also understand now why Communism has undergone so much ridiculing assault and persecution from American government and its foreign policymakers. 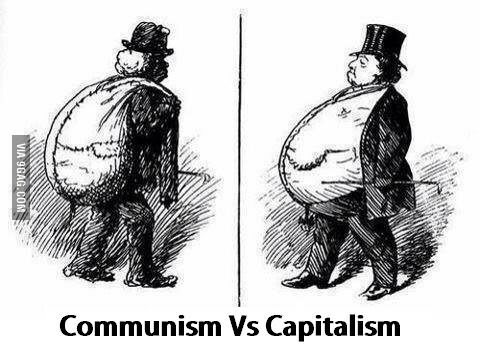 The reason that Communism has been so hated by America and other Western super-powers, is that, in theory, Communism – much like Socialism – seeks to level the playing field for all of its constituents; it seeks to eliminate the ideal of socio-economic grouping, class, or caste. In a developing third world country, this kind of system can be quite advantageous. Let it be known, however, that such cannot be achieved without integrity, honesty and a regime that has a genuine love for its people. In order to level the playing field, the nation must take more of a nationalistic approach to harnessing whatever its valuable and natural resources are, and market those to the outside world so that its own Republic may reap the benefits, thereby creating a better quality of life for the whole of its people. Or, if multi-national corporations wish to share in the harvesting of some of the nation’s natural resources, or desires the use of its fertile land to manufacture and produce specific products to be sold globally, a tax should be imposed upon such corporations who wish to do so. This keeps the wealth of that nation inside its own gates. The leaders and administrators of a Communistic system – as in all systems of government – must be willing to put aside selfish interests, and solely strive for the betterment of all of its people. Such a concept does not bode well in the minds of Western capitalists’, whose thirst and greed for acquiring insurmountable wealth, power, control, dominance, and the hoarding of natural resources – water not excluded – has become unquenchable. This very mindset is what lies beneath every American-led (which are numerous) coup d’etats, successful and unsuccessful overthrows of foreign leaders and/or governments over the last two centuries. This is the root of foreign hatred towards America, not some non-existent jealousy of Americans’ materialistic fortune as so many believe. It is actually their meddling in affairs that do not concern them, and the exploitation of others, that they have been historically and directly responsible for. Through the use of mass media mental impressions, American governments’ and corporate entities’ primary objective has been to imprint an undesirable depiction of Communistic countries into the minds of Americans – a depiction carefully designed to gain the American peoples’ approval to intervene in actions that are positioned to be perceived as inhumane in those nations. These depictions often describes a leader who is a tyrant who abuses his own people. I’m sure this sounds a bit familiar to you – Muammar Gaddafi, Fidel Castro (went rogue due to America prodding), Sadaam Hussein, Presidents Miguel Da’vila (Honduras) , Jacobo Arbenz (Guatamala), Jose Santos Zelaya (Nicaragua), and the list goes on and on. History has found these accusations, in just about all cases, to be untrue. America’s “intervention” or interference in the personal affairs of foreign nations – which usually centers around some corporate financial interests there – is often dressed up in military garb, using militaristic force, all under the guise of implementing democracy. It is European – turned American – Imperialism at its finest! America oppresses these developing nations who simply desire a better way of life for the people of their homeland. Nationalization of resources or taxation of foreign countries for the use of or access to them, would cost American born, multi-national corporations, money; and could also result in the exile of those American corporations who don’t want to play by the new rules. Herei n lies the makings and eventual pursuit of a regime overthrow. They are conspired only to retain a financial foothold inside the corridors of these developing nations. Instead of playing by the rules of those nations, respecting the direction in which they are choosing to move their country, America bends them over, backwards, and around, to play by their rules. If the regime won’t cooperate, American-created unrest, chaos, and war will often follow as a result to cause a destabilization and division in the region. This makes for easy takeover via the installation of a”puppet” regime. I share this sort of information with you so that we can all fully overstand the shape of our world, which cannot occur without first overstanding the shapers of it. If we are to change anything about it, we must know from whence we came and how we got here, in order to go in a different direction – or else we will end up traveling simultaneously in circles. Once your “eyes” are awakened to how this monster moves, you will never be fooled again. You will know why you should question its every move, whose side to stand on and fight with. Don’t be surprised if more often than not, you are standing opposite of the good ole’ U.S. of A. Whenever America is heavily involved in a foreign country that is rich in particular minerals, resources, crops, or landmass that can produce a valuable asset, it has nothing to do with any democratic installation. Their presence is purely to protect American interests abroad – interests that are usually specific to some huge, multi-national, multi-billion dollar corporation in the West, and carries no benefit at all to the typical citizen. « What’s The BIG DEAL With All The Immorality?